The invasion of France was less than three months away and Allied forces were massing across England. As planners labored in secret in preparation for the combined naval, air and army assault on the beaches of Normandy, they made a stark realization that the system they were depending on to allow ships and ground anti-aircraft units to identify Allied planes, called “IFF” (Identify Friend or Foe), was not up to the task. Put simply, based on the planning numbers, there would be so many Allied airplanes over the beaches of Normandy that the IFF system would be overwhelmed. As visions of German Luftwaffe counter attacks and air battles played out in the imaginations of the planners, they knew that something had to be done or, amidst the chaos that might well result, friendly fire incidents would become commonplace. 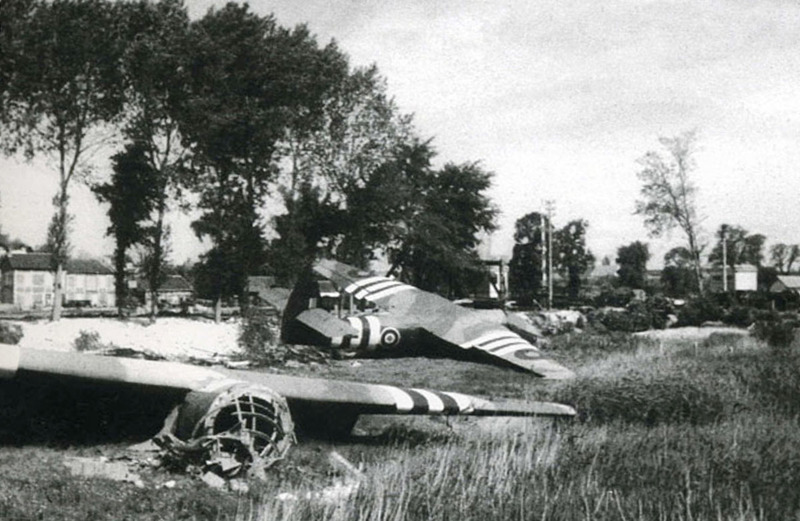 Horsa gliders with their D-Day invasion stripes in clear evidence — these two were among those that landed at the famed Pegasus Bridge engagement that took place a few minutes after midnight on the early morning hours of June 6, 1944. Aircraft on all sides of the conflict already carried dramatically different markings, different camouflage patterns as well as insignia on the sides of the planes and on the top and bottom of the wings. The Luftwaffe planes bore black crosses with white outlines. RAF and Royal Navy planes had roundels of blue and red (blue, red and white under the wings and on the sides). USAAF aircraft carried the “stars & bars” of America. Even with these markings, however — and even with the different shapes and sizes of aircraft involved — naval and army anti-aircraft gunners often failed to accurately identify friend from foe. Something easy would have to be developed — and quickly. 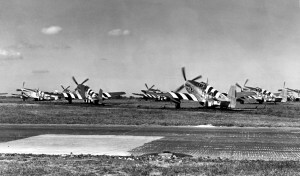 The answer was to apply large black and white stripes to the tops and bottoms of the wings of all of the aircraft types that were likely be confused with German planes — only the large four engine bombers of the RAF and USAAF were exempted from having stripes and only then because Germany had no four engine planes in common usage at all! Tests showed that the stripes could be identified much farther away than the typical national insignia and, given that no other airplanes on any side of the conflict bore such stripes, naval and army gunners could be told to simply fire on anything that didn’t have stripes. It was a simple, even elegant solution. Plans moved forward quickly until one of the team recognized that if the Germans found out about the stripes in advance, they might paint some of their own planes with stripes too so as to avoid getting targeted! With that realization, the idea of what by March 1944 (this month in aviation history) were being called “invasion stripes” was classified as a military secret. In fact, none of the USAAF squadrons or support units were told anything at all about the plans. A complete silence descended on the issue of identification and anyone who inquired was just told that it was “handled”. Finally, at the end of May, the invasion fleet was fully assembled along the English coast. Troops were receiving orders to embark and some were already arriving to their ships. It was time to unveil the invasion stripes — if quietly. Word was passed to all of the ships in the invasion fleet that a flyover of several Allied planes would take place on June 1. They were told to pay close attention to the special stripe markings that each of the planes would carry — if any plane on D-Day had stripes, they were to know it was Allied and hold their fire. On schedule, the flyover took place, even if just those few planes of the RAF and USAAF had yet been painted — as of yet, none of the squadrons in England had been told anything about the upcoming order. Finally, the order to paint the planes was issued on June 3 and 4. As one can imagine, a grand scramble for black and white paint resulted as the planes were quickly prepared. A P-51B Mustang of the 354th Fighter Group, the highest scoring fighter unit in the ETO, shows off its new D-Day invasion stripes. In the early night hours of the morning of June 6, 1944, the invasion began. Two thousand transport aircraft and 870 gliders under tow dropped paratroopers and and other airborne forces into the farmlands and villages behind the beaches. Nearly without exception, every one of those planes and gliders carried the black and white invasion stripes. By morning, 2,500 fighter planes and 700 medium bombers swarmed overhead as the troops rushed ashore. All had been painted within the previous 48 to 72 hours! By first light, both heavy and medium bombers dropped thousands of tons of bombs on the beach defenses. As wave after wave of Allied aircraft swarmed overhead, the invasion fleet arrived off the coast of Normandy Beach, France. 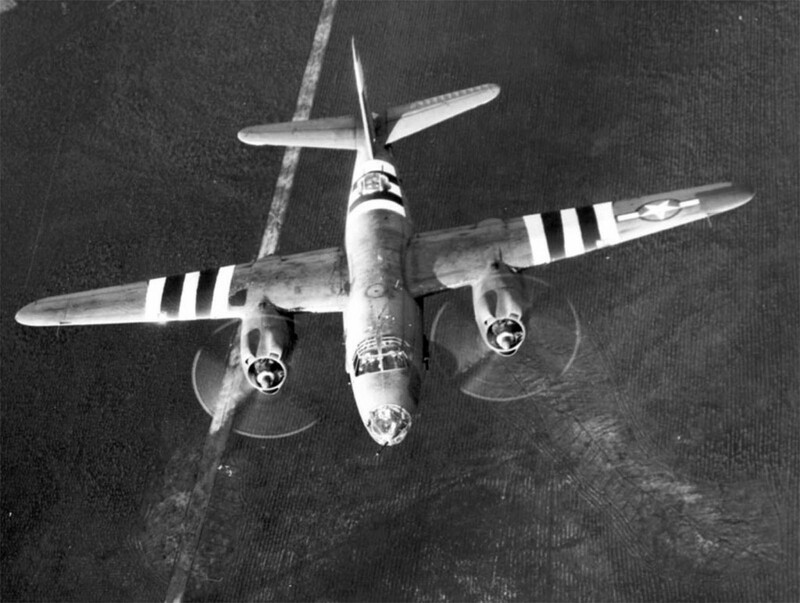 D-Day had begun — with almost no friendly fire incidents against aircraft at all. Yet the reason for that had less to do with the invasion stripes and more to do with the simple fact that the German Luftwaffe didn’t show up that day. Put simply, the Luftwaffe and its pilots had been decimated in the months leading up to the invasion. What was left was caught unprepared and unready for the assault. If it was flying over the beaches, the Allied naval and army gunners soon realized, it was on “our side”. Further, deception operations had focused the Germans on an invasion farther east, near Calais. At night, German radars even had tracked a veritable wall of ships slowly advancing toward the northeastern beaches. When news of the attacks at Normandy registered, the German leadership — including Adolf Hitler himself — believed that the attacks there were a feint designed to draw off German defenses to the west and open up the avenue for the main attack. They were entirely wrong. As for the “wall of ships” that the radars had detected, it was actually a squadron of bombers flying back and forth dropping millions of strips of aluminum foil — so-called “Window” — floating downward slowly toward the water below, reflecting radar. With every flight back and forth, the planes advanced slightly toward the coast. The result was the appearance of a fleet of ships approaching at about 10 kts speed. 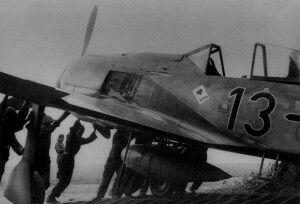 Josef Priller’s Fw-190A-8 “Black 13″ of JG 26 at the time of the invasion. Incredibly, only three Luftwaffe planes flew on D-Day over the invasion beaches. Twelves others were intercepted well away from the beaches as they flew toward the fight. The most famous of the Luftwaffe flights that day happened at the height of the invasion, in mid-morning. A pair of Luftwaffe fighter planes made a daring run down the beach at very low altitude. 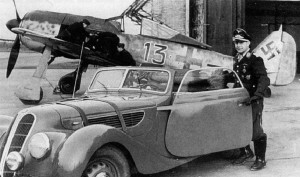 The leader of the pair was Luftwaffe ace, Josef “Pips” Priller, who was Geschwaderkommodore of JG 26, and his wingman, Heinz Wodarczyk. Both flew in Focke-Wulf Fw-190A-8 fighter planes. Incredibly, Priller was hung over from a night out of serious drinking on the evening of June 5 — he flew anyway. When asked years later about the flight, he simply stated that he had wanted to see the invasion for himself and to get an understanding of just where the real attack was taking place. As it happened, for most of the naval and army anti-aircraft gunners along the beach — many on board ships — those were the only two airplanes they saw all day that didn’t have stripes. Predictably, they all opened fire, pointing everything they had at the two planes. They all missed and Priller and his wing man returned to their base undamaged. 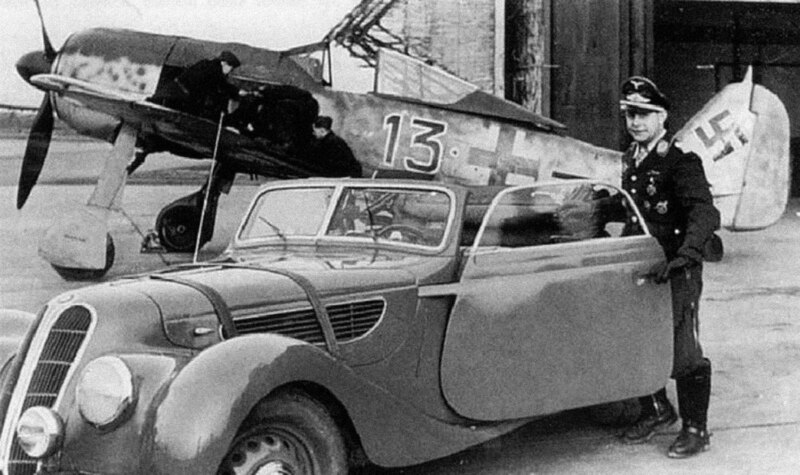 The dashing Luftwaffe fighter pilot, Josef Priller, poses in front of his Fw-190A-8 “Black 13″, alongside his BMW motorcar. Thus, the idea of the D-Day invasion stripes had worked perfectly — even if it wasn’t needed in the end. By December 1944, all of the USAAF, Royal Navy and RAF squadrons had received orders to remove the stripes from the sides and wings of their planes. 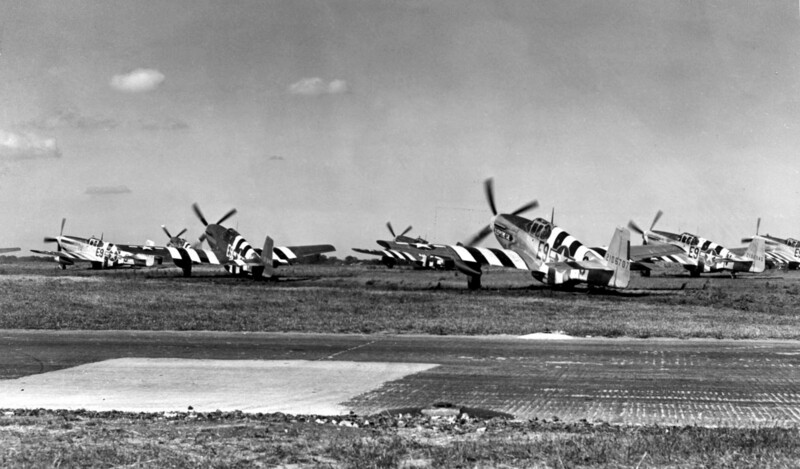 Although D-Day invasion stripes remain one of the visual hallmarks of Allied air power during World War II, they were actually in use for just six months of a war that lasted half a decade. As it turned out, they were probably nothing more than a glorious waste of paint. 1. A third Luftwaffe plane flew over the Allied invasion fleet at Normandy Beach on June 6, 1944. What type was it and what happened? 2. Were “invasion stripes” ever used again in history by the Allied powers or by NATO? When, why and where? The RAF and RAAF used the stripes in Korea and the RAF used a similar pattern, of yellow/black instead of white/black in the Suez operation. Invasion stripes where used during Operation Musketeer (1956) by France, UK and Israel. In one of my tours in Germany I sat in on a meeting with several WW II Luftwaffe personnel and one former Luftwaffe pilot mentioned he had flow an Ar-234 on D-Day over the beaches to recon the invasion effort. Needless to say, the fast jet bomber turned recon aircraft on this mission was too fast for AA guner or Allied aircraft.